Boy is a street urchin who stays alive picking pockets while trying to keep away from the head of the local gang. Boy is caught during an auction for a menagerie of exotic animals left behind after their keeper's death. From his high perch where he is awaiting his punishment, he helps Mr. Jameson place the winning bid for an elephant named Maharajah and in gratitude, Jameson hires Boy on the spot and gives him the name Danny. After Maharajah destroys his train carriage it is decided that Danny and the elephant will walk the 200 miles to Mr. Jameson's zoo with Danny disguised as Indian prince Dandip. 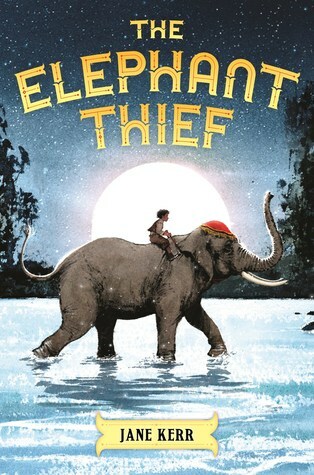 What's more, Jameson makes a bet with another menagerie owner that Danny and the elephant can make the trip in just one week and if he loses, the consequences for both will be dire. I'm always drawn to stories with animals as well as people who have special connections with those animals so I was looking forward to starting this book. It read younger than I was anticipating but I'm not feeling like it's going to grab my sixth graders' attention despite the adventures throughout the book. I struggle with main characters who don't talk because that places quite a burden on the writer to keep my interest when that character can't really interact with the rest of the characters. I have yet to read a book or see a show with a mute character where the writer was entirely up to that challenge. Except for the episode "Hush" on Buffy the Vampire Slayer. Everyone should take notes from that. And nearly all episodes of Buffy, for that matter. But back to my point, it is frustrating to see situations arise that could be easily resolved if the character would just say a couple of words. I do love Maharajah and Mr. Jameson's joie de vivre but the book overall was merely okay for me.